(CN) – The public comment period for President Donald Trump’s review of 27 national monuments and marine sanctuaries ended Monday, and environmental organizations say the public overwhelmingly opposes any reductions or eliminations of the protected areas. As the Department of Interior moves to the final phase of its review that encompasses more than 11.2 million acres of land – mostly in the American West – and 217 million acres of ocean on both sides of the continent, the League of Conservation Voters said 2.7 million Americans submitted comments in support of public lands during the 60-day comment period. “It’s no wonder communities across the country mobilized to submit over 2.7 million comments so quickly when people overwhelmingly disapprove of the Trump administration’s extreme anti-environmental policies,” the league’s president Gene Karpinski said. In states like Nevada, New Mexico, Colorado and Arizona, 80 percent of the comments submitted to the Interior Department support keeping monuments intact, the league said in a statement Tuesday. The department took action to review the monuments after Trump signed an executive order in April giving Interior Secretary Ryan Zinke the authority to review several monuments to determine whether the designations by various presidents under the Antiquities Act were done with an appropriate level of input from all parties. In several rural parts of the American West, federal ownership of land – extensive in states like Nevada, Utah, Arizona and California – is perceived as intrusive, with land-management practices seen as restrictive. But the opposition to the review and the prospect of reducing some of the protected land has induced the anger of environmental organizations and lawmakers who represent some of the states where monuments are under review. U.S. senators from New Mexico, Colorado, Washington state, Nevada and Hawaii released statements denouncing the Trump administration’s nascent approach to public-lands management. The senators all said public support for the monuments needs to be considered, but also the economic benefits of tourism associated with the monuments – many of which facilitate a wide array of tourist and recreational activities. Bennet said the Outdoor Retailer Show – one of the largest trade shows for manufacturers of outdoor equipment like bicycles, climbing equipment, tents and other camping gear, kayaks and clothing – moved from Utah to Colorado because the latter displayed the appropriate commitment to public lands. In fact, much of the impetus to explore reducing or even rescinding national monuments designated over the past two decades by both Republican and Democratic presidents has come from Utah’s congressional delegation. Utah Congressman Rob Bishop, the chairman of the House Natural Resources Committee, asked Trump’s presidential transition team to explore undoing national monuments designated by former President Barack Obama. “Any monument designation that lacks local support, is excessive, or violates the terms of the Antiquities Act will be scrutinized and is easier to abolish,” Bishop said soon after Trump defeated Hillary Clinton in the presidential election. Bishop and other Utah lawmakers, including Gov. Gary Herbert, were incensed when Obama set aside 1.9 million acres in southeastern Utah currently known as the Bears Ears National Monument. 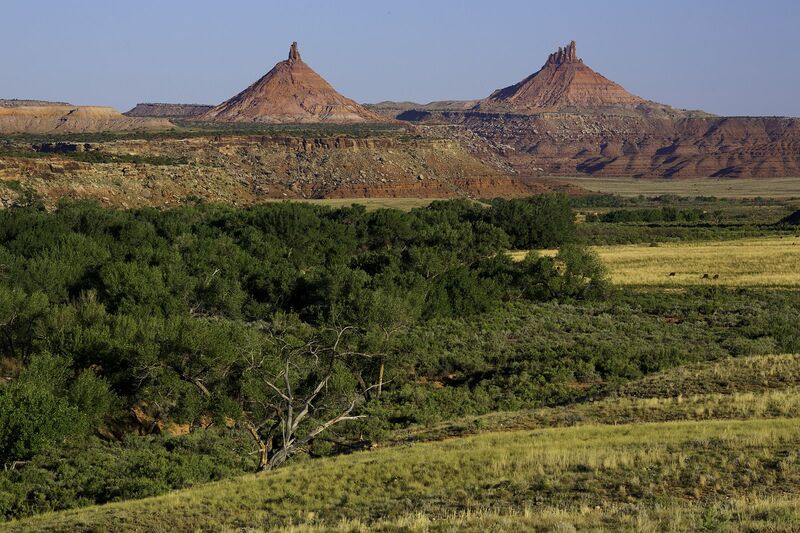 The name refers to a land formation sacred to at least five Native American tribes in the area, many of which point to the large number of artifacts in the area as a primary reason for protection. But Utah legislators said the designation was done without and in some cases contrary to the input of the state residents, and said the designation was yet another federal land grab that prevents the state from managing the land to benefit both the environment and the local economy. Critics of Bishop, Herbert and others say this argument is a cynical ploy meant to distract from the fact that those lawmakers want to pave the way for natural-resource extraction industries, like mining and oil and natural gas, to plunder the land for profit. Lawmakers have downplayed the potential for development on the lands, but a recent exploration of Bureau of Land Management documents show energy companies have repeatedly pushed the agency for leases of 100,000 acres within the monument. Zinke has already recommended shrinking the 1.9 million-acre monument, and environmentalists believe he has done so with the intention of opening up the land to drilling. “Zinke’s public-review process was a complete sham from start to finish,” said Randi Spivak, the center’s public lands program director. Regardless of Zinke’s recommendation, some have cast doubt on whether Trump is within his legal authority to reduce or eliminate the national monuments. The lawyers say Congress is the plenary authority over public lands and the president cannot act unilaterally unless Congress delegates land-use decisions to the office – as is the case with the Antiquities Act. Zinke’s review of the national monuments ends Aug. 24.